Driver and Vehicle Standards Agency (DVSA) expects 1000 learner drivers will take part in the revised tests which will continue until the end of the year. Grant, of Bearsden, East Dunbartonshire, sat his exam at Bishopbriggs Driving Test Centre on April 27. A teenager has become the first in the UK to pass his driving test – using a SATNAV. 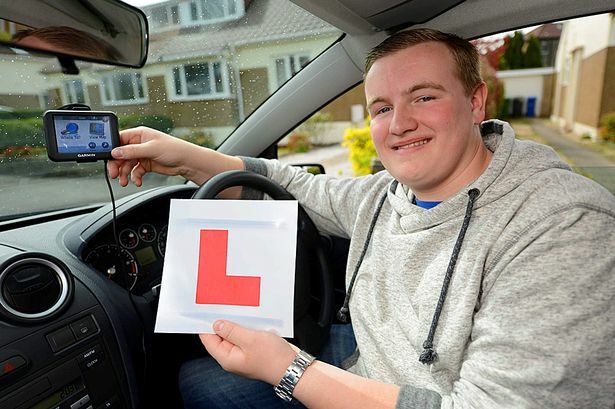 Grant Ferguson, 17, of Bishopbriggs in East Dunbartonshire, Scotland, threw away his L-plates following a nationwide shake-up intended to bring the driving test into the 21st Century. His local driving test centre was chosen as one of 20 in the UK to trial the revised practical exam with the help of a GPS navigation system. The examiner set up a route on the device for the first twenty minutes of the test and Grant followed the satnav verbal instructions. He said: “I had been learning to drive for about a month when the opportunity came up to try out the new test. I felt like I was part of an important change. “Introducing the satnav into the test is about training to make sure that you’re only listening for guidance and not staring at the screen too often. “I’ll definitely be buying a satnav because that’s what I know and it gives you a bit of freedom to go where you want. “I’ve wanted to drive for a very long time. I was a bit relieved that I didn’t have to do the reverse around the corner in the test. If the trial is successful, it could be the biggest shake up of the test since the written theory exam was introduced in 1996. The changes could see the three-point turn and reversing round a corner scrapped. These will be replaced with more commonplace manoeuvres such as reversing out of a parking bay. Candidates will also be asked safety questions while on the move, instead of at the start, and asked to operate switches such as screen heaters, according to the Driver and Vehicle Standards Agency (DVSA). Drew Nicol, Grant’s teacher at the Popular School of Motoring in Kirkintilloch, East Dunbartonshire, said: “My driving school was one of the first to register for the trial. “I think it’s a good idea and much more realistic. “Drivers are using the satnav more and more now as a means of direction and the new test is designed to reflect this. Motoring groups have urged caution in removing manoeuvres like a three-point turn, saying it can be essential if satnavs lead drivers down a dead end road.